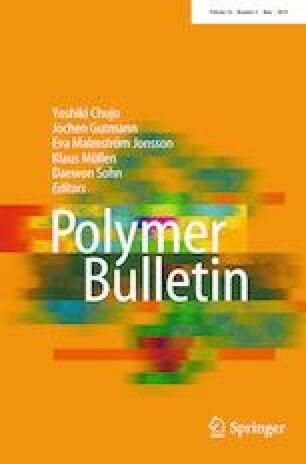 In this study the influence of boron acrylates as functional monomer on adhesive and cohesive performance of water-borne pressure-sensitive adhesives coated on bi-orientated polypropylene (BOPP) has been investigated. A series of pressure-sensitive adhesives with different monomer composition was prepared using emulsion polymerization. The monomers were butyl acrylate; methyl methacrylate; acrylic acid; boron acrylate; and multi-acrylate functional boron methacrylate. The adhesive performance was studied at 0, 1.3 and 3.9% of boron acrylate monomer content based on total monomer composition and 1% of multi-acrylate functional boron methacrylate. The adhesives obtained with constant thickness were coated onto a BOPP and evaluated for the performance by measuring the tackiness, peel strength and shear strength on several surfaces including stainless steel, glass, aluminum (Al) and low density polyethylene. Results showed that addition of boron acrylate was slightly increasing the adhesion and cohesion performance on non-polar surfaces. While it did not show any dramatic decrease in the adhesive performance for different surfaces, the decomposition temperature showed increase in TGA analysis. The authors would like to express their gratitude to Istanbul Technical University Research Fund and Organik Kimya San. ve Tic. A.Ş. for their technical and financial support (ITU-AYP-2014-6).